Like all of the creatures on this website (except for Slugs), Crayfish are members of the Phylum Arthropoda. Within that Phylum, they belong to the Subclass Crustacea, which is the same group that sowbugs belong to. Among the crustaceans, crayfish belong to the Order Decapoda, which also includes many familiar marine creatures, including lobsters, crabs, and shrimp. The 530 species of crayfish recognized worldwide are distributed in three families: Astacidae, Cambaridae, and Parastacidae. The Astacidae is composed of approximately 13 species and is distributed in Europe, western Asia, and the extreme northwestern United States and southwestern Canada. 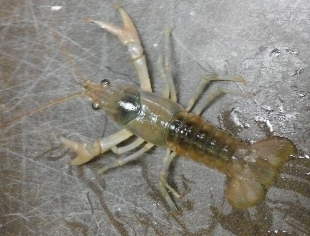 The Cambaridae family, with over 400 species, represents the two-thirds of the world’s crayfish species; members of this family are found natively in North America and eastern Asia. 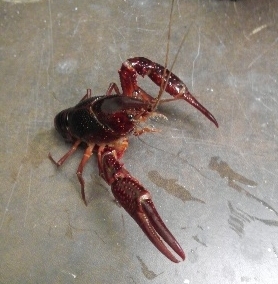 All Kentucky crayfish belong to Cambaridae. The Parastacidae (containing around 130 species), or Southern Hemisphere crayfishes, are found in Australia, New Guinea, Madagascar, and temperate South America. The lives of crayfishes consist of a continuous process of shedding, or molting, their old exoskeleton, and growing and hardening the new exoskeleton (Figure 1). In the days leading up to molting, crayfishes begin to break down the calcium salts in their exoskeleton and store a small amount of them in small whitish dislike structures called gastroliths. These structures will provide the important initial source of calcium used to harden the new exoskeleton. During the molting process, crayfishes are very vulnerable to predation because they are soft and unable to move effectively: they find refuge under rocks, in woody debris, or in burrows. Crayfish begin their life as fertilized eggs attached to the underside of the female’s abdomen from early March to late May. After hatching from the eggs, juvenile crayfishes (looking alike the adults) will stay attached to the underside of the female’s abdomen for several days, usually going through two or three molts as body size initially increases. After detaching from the female, juvenile crayfishes begin life as free-living individuals foraging for food, finding shelter, and growing to adult size. Males Cambaridae (all Kentucky species) are classified as either form I or form II: the former being reproductively active and differ from the latter in having longer, more pointed terminal elements of the gonopod (or stylet) and larger hooks on the ischia of the pereiopods. Copulation in Cambaridae crayfishes is believed to occur mostly in the fall months from September to November. Sperm is transferred from openings at the base of the male’s last pair of pereiopods to the female via the male’s gonopods into the annulus ventralis or gonopore of the female. She will store it overwinter. In the late winter or early spring months (usually February or March), females will move to a secluded location and will release their unfertilized eggs and simultaneously release the sperm stored in her gonopore, thereby fertilizing the eggs. Prior to egg laying, the pleopods are coated with a sticky substance, known as glair, excreted from glands on the underside of the abdomen. A single female can lay between 50 to 400 eggs in one season of reproduction. Copulation is usually initiated by the male after coming in contact with a female. He will crawl on top of her and hold her chelae and pereiopods with his chelae (Figure 2). The copulating pair can remain locked together for an extended period of time, often an hour or more. It is estimated that most Kentucky crayfishes live from two to three years. In general species that grow to larger sizes such as Barbicamburs cornutus and Cambarus cumberlandensis may live for five or six years while smaller species, such as those in the genus Cambarellus, may live only one year. Evidence suggests that some populations of cave-dwelling species in the genus Orconectes may live for at least 20 years. Crayfishes occupy a wide range of habitats: rivers, creeks, swamps, sloughs, subterranean creeks, springs, ephemeral ponds, reservoirs, ditches, and wet field. The primary life-history trait of crayfishes that determines the habitats in which they can live is their propensity for burrowing. Crayfishes have been classified into three categories of burrowers: primary, secondary, and tertiary. Primary burrowers (Figure 3 A) will emerge from their burrows to forage for food or look for mates during wet spring or fall months and on warm, humid nights. Secondary burrowers (Figure 3 B/C/D) are those species that spend a significant portion of their lives in burrows but will also frequent creeks and ponds throughout the year. Their burrows are usually less complex than those of primary burrowers and differ from those in that they usually have a connection or tunnel leading to a permanent water body (Figure 3 D). Tertiary burrowers (Figure 3 E) are those species that only occasionally retreat into simple burrows during times of drought or when females tend eggs. They usually inhabit permanent flowing rivers and creeks and build shallow vertical shafts into the substrates. As crayfish excavate their burrows they will push the loose soil or mud up and out of the burrow opening. This activity will usually lead to the formation of a chimney rising several inches above the ground. They will plug the opening with mud during dry or cold months and remain inactive for weeks or even months. those of a secondary burrowing species; E, that of a tertiary burrowing species (from Hobbs 1981). Crayfish respire with gills and to extract oxygen from the air their gills must remain moist (they can stay out of the water for up to 72h in those conditions). 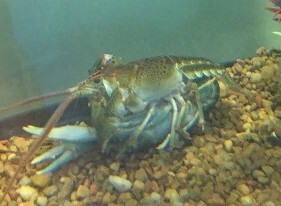 Burrowing crayfishes will usually dig vertically into the substrate to reach the water table, thus allowing them to colonize habitats with semi-permanent standing water (such as low-lying ditches, shallow ponds, wet fields, and prairies), or to survive times of drought in more permanent aquatic habitats. Historically treated as opportunistic omnivores, crayfishes have been shown to eat a variety of food items, both living and dead. These include aquatic and terrestrial vegetation, plant detritus, insects, snails, and aquatic crustaceans (e.g., isopods, amphipods, and copepods). Crayfish play an important role in ecosystem function by consuming detritus and vegetation and converting that material into animal protein. That protein is then made available to a wide range of other aquatic and terrestrial organisms such as predaceous insects, fishes, birds, and mammals. Over 240 different species of animals are known to feed on crayfish. Finally, crayfish are considered “ecosystem engineers” due to their burrowing activities. Engineers are organisms that directly or indirectly alter the physical state of biotic or abiotic components of the environment; they maintain, create, alter, or destroy habitats for other organisms in the environment. We know of several organisms using crayfish burrows and/or chimneys, including dragonflies (who deposit eggs inside crayfish chimneys for the humidity and despite the potential risk of predation for the eggs), crawfish frogs (who live exclusively in crayfish burrows), and fish that use crayfish burrows to avoid desiccation in case of drought. Crayfishes can be found on every continent in all type of aquatic or semi-aquatic habitat, Antarctica. They are considered as invasive species in Europe, Asia, and even in the United states. As the best representative of invasive crayfish, the red swamp crayfish (Procambarus clarkii) is among the most translocated invertebrates in the world. Although found in Northern Europe, its populations are not expending anymore. Contrariwise, in Southern Europe, the red swamp crayfish is expending and replacing native crayfish at an alarming rate. In Africa, it is during a biological control attempt of snails that P. clarkii was released (e.g. in Kenya). Whereas, in the United States, it is believed that anglers using the red swamp crayfish as bait introduced it to states away from its native area, the Mississippi river. There are over 50 species of crayfish known from Kentucky's streams, lakes, caves, wetlands, and other freshwater habitats. Many of them are rarely encountered by humans, and most are similar in their overall appearance. Visit the overview of Kentucky crayfish (PDF) from the Kentucky Department of Fish and WIldlife Resources for a comprehensive list of species. A few of the most common species are listed and pictured below. The Bottlebrush crayfish, Barbicambarus cornutus, occurs in creeks and rivers in the Green River drainage of north-central Tennessee and west-central Kentucky. It is unique among all species in the family Cambaridae in that it has dense clumps of long setae along the entire length of its antennae. Two color forms are known: one with large dark brown patches over the entire body including the chelipeds; the second form lacks splotches. Both forms have an overall base color olive green to brown. The maximum size known for the species in Kentucky is 134.5 mm total length. It is the largest species of crayfish likely to be encountered in Kentucky (the maximum reported size for the Procambarus clarkii, the red swamp crayfish, is 160 mm total length, specimens exceeding 110 mm are rarely seen in the state). The species is most commonly found under large, flat boulders along creek margins where there is a high current. Occasionally, it can be found in shallow riffles if there are large boulders presents. Almost nothing is known about the life history of Barbicambarus cornutus. The red swamp crayfish occurs on the Mississippi floodplain in Western Kentucky past Kentucky Lake. It is the most pollution tolerant of the crayfishes and, although native from Louisiana and the Mississippi river basin, it is found on every continent as an invasive species: it is among the most translocated invertebrates in the world. In Kentucky, P. clarkii is found in swamps, vegetated ponds, seasonally flooded ditches, and creek. During drought it will be found in deep burrows up to 2 m in depth. Its burrowing activities are so intense that sometimes they are the cause of stream bank collapses. The rusty crayfish is present in central (Green river drainage) and northern Kentucky (lower middle Ohio River drainage) in reservoirs, creeks, and rivers of all sizes with a wide variety of substrates. Usually found under cobble or woody debris in lotic habitats, it can also be found under riprap or among rooted vegetation or submersed logs in lentic habitats. O. rusticus has been widely introduced across the USA, as it is used by anglers as bait. 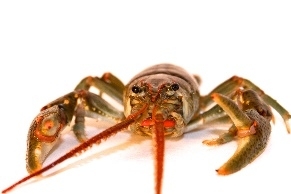 It is considered to be the most invasive species of crayfish in North America. Crayfish are easy to capture but not as easy to photograph. You can use funnel traps with cat food as bait, simple hand-netting, or electro-fishing techniques if you are a permitted scientist. Kick-netting is the best but requires two people: one kicking the stream bed and the other one catching the escaping crayfish downstream. Since these are aquatic invertebrates, it requires special skills if you want to photograph them in their natural aquatic habitat. However, they can be naturally anesthetized by cooling their water with some ice (be careful to not freeze them: go progressively). Once outside of the water they will remain stationary for a few moments. This will allow a photographer time to dry the crayfish slightly (to reduce glare) and to capture a good image. When disturbed, crayfishes can speed up to 50 yards in a couple of second away from the source of disturbance using tail flips! It is believed that they use chimney positions or chemicals as landmarks when dispersing between water bodies throughout the landscape. We still do not know the function of the bottlebrush crayfish unique dense clumps of long setae along the entire length of antennae! The Tasmanian giant freshwater crayfish, Astacopsis gouldi, is the largest freshwater invertebrate in the world, and can grow up to 31". Have you heard any myths, legends, or folklore about crayfish? If so, let us know. Hobbs, H.H., Jr. 1981. The crayfishes of Georgia. Smithsonian Contributions to Zoology No. 318. Rusty Crayfish Head Banner photo courtesy U.S. Geological Survey, U.S. Geological Survey, Bugwood.org.